A well-aged, stronger lager, brewed in March, for consumption during and around Oktoberfest time. Golden-yellow to amber in color. Malty with a light sweetness. Slight hops bitterness. Optimal serving temperature is 46-48° F (8-9° C). 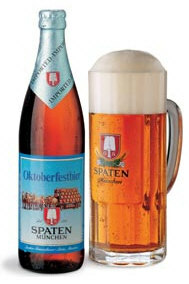 Oktoberfestbier was first served in 1810 at the first Munich Oktoberfest. Prior to the invention of the cooling machine by Carl Linde in 1876, March was the last month in which it was possible the brew Lager beer before the hot summer. This is because a temperature of 6 to 10°C is necessary for fermentation with bottom-fermenting yeast. This last March beer of the year was always brewed to be somewhat stronger, stored until the autumn and enjoyed at the festivals.